When Life Gives You Lemons… – amandarobots. Last summer was the summer of iced tea for me, but recently, I’ve been craving something different. I bought a lemon one day, and I always have strawberries in the freezer, so I decided to make my own strawberry lemonade. It’s super quick and easy, and you can make a whole bunch and put it in the fridge or just make it by the cup like I do. – A strainer. I use a really little one that sits perfectly on the mouth of the jar. – Simple Syrup. It’s basically just sugar and water boiled down until it’s thick, but here’s a recipe just in case you’re curious. I just make a small batch of it and pop it in a little jar in the fridge. – A strawberry, frozen or fresh. 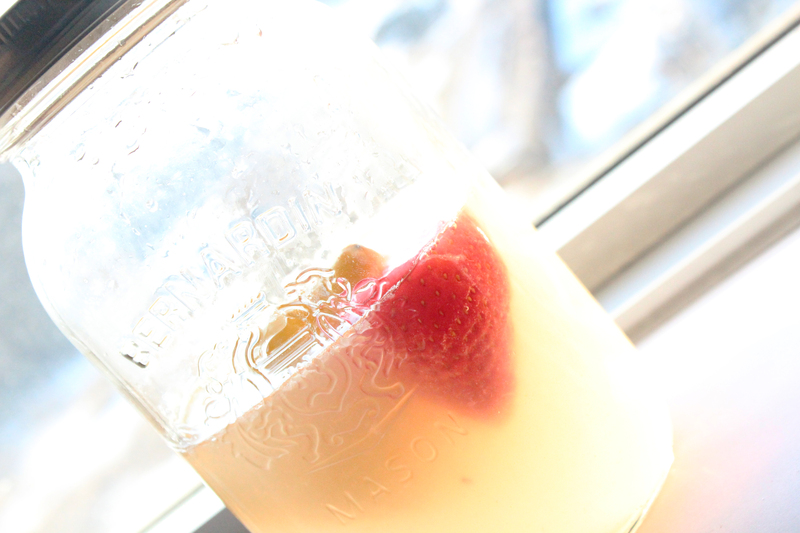 If you prefer, you can use a few raspberries instead to make raspberry lemonade! 1. Wash your lemon and cut it in half. 2. Set the strainer on top of your receptacle to catch the seeds while you squeeze. 3. Squeeze one half of the lemon into the cup. There should be about a teaspoon of lemon juice in there. 4. Add about a cup of cold water. 5. Add about teaspoon of simple syrup. 6. I like to add the lemon half in once it’s been squeezed and no more juice will come out. I think it’s cute and I’ve convinced myself that it adds more flavour. 7. Stir or shake the mixture together. 8. Taste it, then adjust it to taste! Too watery? Add more lemon. Too sour? Add more water and sugar. Too sweet? Add more lemon and water. b) blend or mash up the strawberry in a separate container to release more juice. This’ll give a stronger strawberry flavour. 10. Pop in a straw and consume. You can also play around with the recipe to make it your own. Add some alcohol of your choosing if you’re into that. Substitute a lime for the lemon and some mint for the strawberry and you get a mojito-y beverage.